I saw lots of red foxes today in Valley Forge. I think they were in love as they were making lots of noise and chasing each other through the fields. The first pair was too fast and hid immediately. The second pair was a little different. I was walking back to the car. I heard rustling in the bushes and thought it might be a bird. I set up my tripod, but nothing, so I kept walking and just as I did a beautiful fox ran from the spot where I was looking. He ran right to the cliff's edge and disappeared. I raced to the edge and saw the fox at the bottom and already far in the distance. 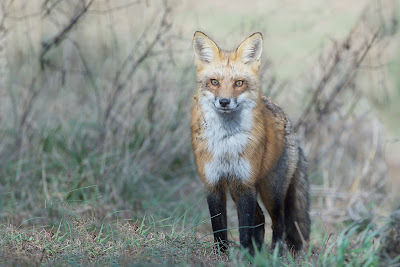 I came back to the road and could hear the foxes screaming at each other. 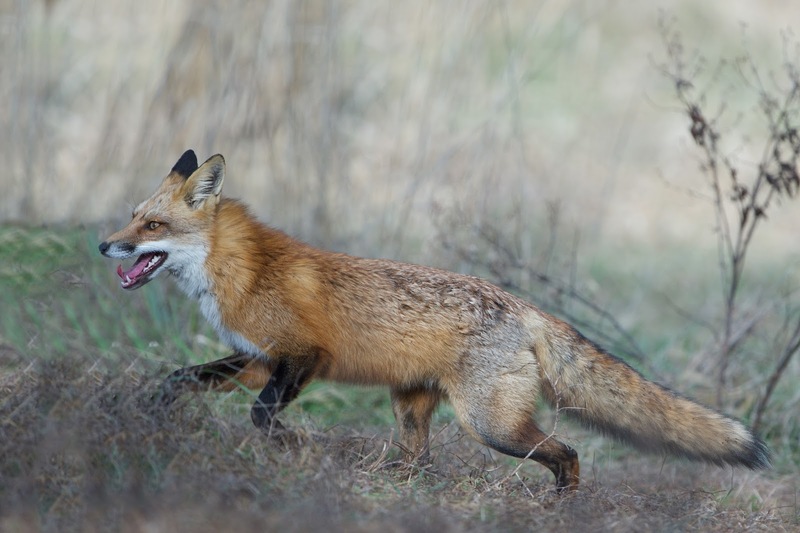 Then one fox came running out of the field directly towards me to cross the road. She (I think) was too quick to catch. But I thought if I went into the field, hid behind a log and set up my camera, the second fox may come too and I would have time to take its picture. Well I waited and waited a good long time - no fox. Then I turned around and there was the first fox coming back to look for her mate. She was so beautiful and was determined enough to not be too phased by the camera.